Prepare to enter a wondrous dream state. Originally hailing from the picturesque Whitsundays, singer-songwriter Brendon Moon relocated to Sydney in 2012 in order to pursue his burgeoning musical career. His determination towards aural uniqueness has led him to develop a sound that is both delicate and powerfully alluring. Moon’s one-of-a-kind stage presence and lush guitar tones are nothing short of exquisite. The artist’s self titlled debut album is the fruit of his passionate labour. 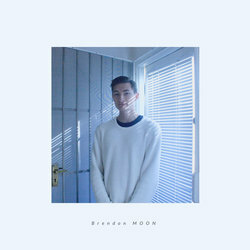 Between the floating, androgynous vocals, meandering melodies and varied instrumental arrangements throughout, the album typifies Moon’s unique and captivating musical style. His featured single “Blue Moon” was the feature track on Triple J’s Unearthed program ‘TOPS’. It’s a dreamy offering of folk-rock that eventually builds into a swirling ball of melodic fuzz. While the lush, well-layered instrumentals do a lot of the talking, it’s his angelic voice that really draws you in. It’s the kind of breezy listening that will effortlessly transport you into another realm. One of the more radio friendly tunes from the album. Hope you enjoy!